Can dogs be both healthy and vegetarian? Is there a specific vegan diet for puppies? While it is common sense that both humans and dogs are omnivores (they’ll eat both meat and vegetables), it is still quite uncommon for most dog owners to feed their beloved pet with vegetables, since most dogs love animal foods. This is explained by the fact that dogs are mostly on the carnivorous side of being an omnivore, meaning that they’ll eat more meat than veggies in general. Dana Humphrey in charge of Public Relations at Kaleb’s Organic Dog Treats says that today’s commercial pet foods are jeopardizing our pets’ health greatly. Believe it or not, these foods are often composed of ground-up parts of animals that the U.S. Department of Agriculture inspectors have deemed unfit for human consumption. This would include the flesh of animals that fall into one of these categories: dead, dying diseased, or disabled. Most pet foods contain the same hormones, pesticides, toxic ingredients and antibiotics that are found in commercial meat products for humans. In addition, studies have shown that the same risks associated with meat consumption in humans like allergies, cancers, heart, kidney and bone problems; are also affecting many companion animals. Due to the various health concerns, ethical reasons, and the severe impact today’s animal agriculture has on the environment; veganism is on the rise in our society. Because of this, more pet owners who are passionate about these topics are making a lifestyle change in their four-legged friend’s diet as well. Although dogs are classified in the order Carnivora, they have evolved biologically as omnivores, meaning their systems can derive nutrients from a wide variety of plant-based sources, including fruits, vegetables, grains, and legumes. Many dogs today are thriving on both vegetarian and vegan diets. One example is a border collie named Bramble, whose vegan diet of rice, lentils and organic vegetables contributed to nearly a record-breaking lifespan of 27 years! At the very most, a dog will end up being vegan or a vegetarian due to the very fact that his or her owner is also a vegan or vegetarian, so they feed the same thing to their pets. This has led some owners to believe that a dog going vegan or vegetarian is not necessary at all. Vegetarians and vegans have argued that dogs can receive all of the nutrients they get even without consuming meat, simply because they are still omnivores. The amino acids that they can get from plant-based foods should suffice even if they completely stay away from meat products. In fact, some dogs may also live longer if they are fed with the right balance of vegetables and no-meat diets. Combining organic vegan foods and veggies with rice, beans and the like can become a great food source for your dog (or growing pup – see below section for puppies). Likewise, some dog owners may also be frustrated if their dog has allergic reactions to certain meat or animal products. In this case, a vegan or vegetarian diet will be just fine for your pet, given it has been recommended by your local vet. Most people do not know that “vegetarian” and “vegan” are two different things. People (and dogs) who consume a vegetarian diet only avoid animal meat products such as chicken, pork, beef and the like. However, vegans also avoid products originating from animals, such as eggs and milk. In the case of a dog’s daily meal, going for a vegetarian diet is okay but heading for the vegan route is more challenging. This is because your dog has to avoid anything that involves dairy products other than meat. While puppies and adult dogs are both omnivorous, it could be riskier to feed your puppy a vegan diet because a lot of nutrients could be insufficient, such as protein, which is a must-have for your puppy’s diet. However, you can simply get protein sources from vegan foods such as soy, corn, whole grains and beans may help your puppy stay fit. Adding coconut or flax oil to a pup’s meal is a great source of healthy natural fats. Here below is a video of a popular vegan blogger who shows how she feeds vegan dog food to her pets. If a dog receives too little protein, calcium, or vitamin D, his or her health could be jeopardized. It’s important to do your research before transitioning your dog to a vegan diet, and do so gradually. There are many recipes and supplements available so that you can make prepare your own vegan dog food and track exactly what’s being added to each meal. 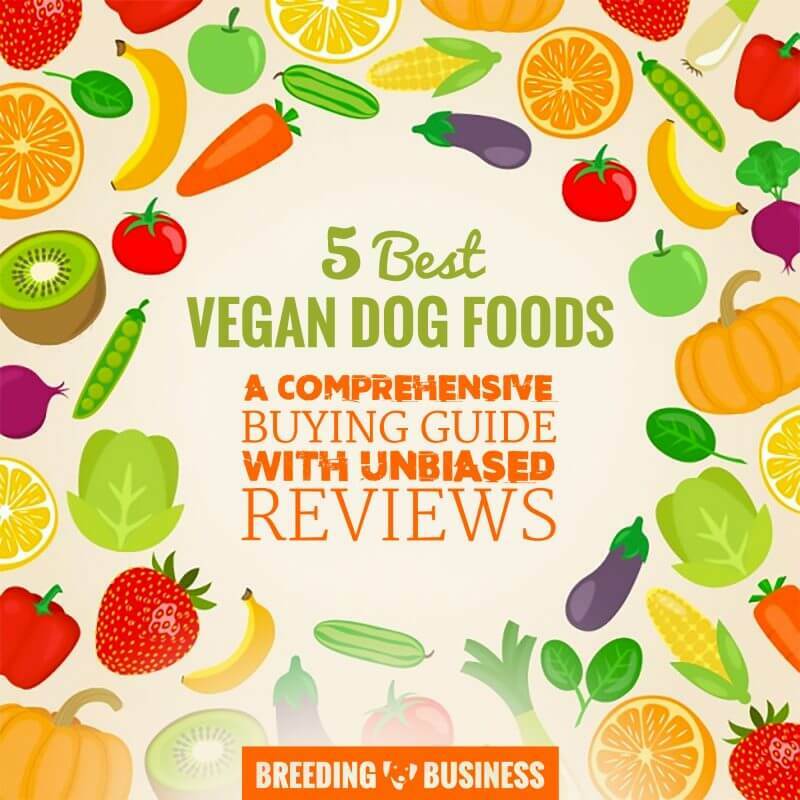 Additionally, when choosing the best vegan dog food, you should consider the following factors first before you go on ahead and buy or prepare it for your pet. It is advisable that your dog should only take 25 grams of protein or less per 1,000 calories of serving. While protein is mostly found on meat, it can also occur on soy and some wheat products. Not knowing how much protein you give to your dog may put your pet’s health at risk. Amino acids such as L-carnitine and taurine may not be digested easily or found in most no-meat and no-dairy diets, whether for humans or for dogs. Your pet may not only have an imbalance (or even loss) of protein but also lack of taurine. These two amino acids are naturally occurring in flesh foods but can be added to the diet via synthetic supplements which are readily available. In fact, there is proof that soy, wheat, corn and other grains take slightly longer to digest in comparison to meat and fish for dogs. This particularly suggests that if your dog has some digestive problems then going on a vegan diet should be consulted with a vet first, just to avoid more complication for your pet’s stomach and digestive system. Such minerals, vitamins and trace elements are commonly found in meat, offal and dairy products and only rarely on plant-based diets, meaning that your dog may have some micronutrient deficiencies if you don’t consider keeping a balance between meat and veggie products. When looking at what kind of vegan dog food you want to feed your dog, here’s how we compared dry, wet and homemade dog foods. Dry Vegan Food — A lot of dry dog foods come in kibble form, which are convenient to store for weeks without getting that really nasty smell and has more shelf life than wet dog foods. Perhaps the only downside to dry vegan food is that it doesn’t hydrate your dog as much as wet foods and processed ones might contain fillers that aren’t necessary for your pet’s nutrition. Wet Vegan Food — Dogs that are older may start to lose their sense of taste and this is why most of them prefer wet vegan food over dry vegan food due to the stronger appeal and palatability. Hydration from wet food is also a plus for your dog’s health. However, wet foods for dogs can easily expire, in comparison to dry dog foods. Homemade Vegan Food — If you don’t like buying from the grocery store due to the fear of unnecessary chemicals and fillers that may compromise your dog’s nutrition, you can stick to homemade vegan food. If you have an organic garden with lots of fresh veggies then that should do the trick. However, people who don’t have a lot of time due to everyday work may find making homemade vegan food for dogs kind of a hassle to do. In a vegan diet for dogs, the focus should be put on keeping the protein levels high and nutritious. We’ve worked hard and selected the 5 best vegan dog foods and vegan dog treats. 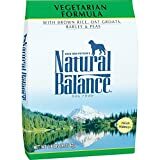 Completely free of dairy and meat products, Natural Balance Vegan Kibble is a healthy dry dog food for the vegetarian and vegan dogs who want premium quality with no compromise. It’s a little pricey, but it’s also free of artificial colors, preservatives and flavors. Linoleic acid, whole ground flaxseed, vitamin E, biotin and kelp are put together in a premium formula boosting your dog’s coat and skin health. Macronutrient ratios are 18% proteins, 8% fats and 4% fibers. Main ingredients include filling oatmeal, and highly-digestible brown rice and tasty potatoes. Healthy fats are brought to your dog thanks to popular canola oil and flaxseed; there are great levels of Omega 6 fatty acids (2%) and Omega 3 (o.3%) making this great vegan dog food complete and balanced. Essential amino acids and quality proteins are also present in good amounts, so are micronutrients, minerals and vitamins. Quick warning, this vegan dog food is not organic, just in case it matters to you. Manufactured without fillers, this vegan dog food is packed with wholesome vegetables and is composed from a 100% plant-based recipe. With over 24% of protein content, this vegan dog food is of great quality both in terms of palatability and nutritiousness. Peas are a big part of this vegan kibble thanks to their great protein profile, while peanuts, quinoa, brown rice and canola oil are complementing the great ingredients list of this premium dog food for vegan dogs. The list of ingredients that are NOT included in V-Dog Vegan Kibble is long so this premium kibble excludes soy, gluten, wheat, corn, animal products, byproducts, and fillers. Additionally, V-Dog is not using any factory farming products from what I understand from their marketing. Dogs are omnivores and can do just fine on a plant-based diet but you have to be extra careful with the nutrients the diet will provide. V-Dog understands that and makes sure their vegan dry dog food is complete and balanced. The moisture in wet dog food decouples its palatability and appeal to dogs, and the very same applies to vegan wet dog food! Natural Balance brings you a wet food that’s vegan-friendly, tasty, complete and balanced. Like its counterparts, this vegan food for dogs includes a lot of brown rice, oatmeal, canola oil, potatoes, and obviously, peas! This is pate-style wet dog food, there is no added sauciness or gravy. This is one of the best vegan canned foods — free of added sugars and superflux dietary fat! Several veterinarian nutritionists are aware of it as the best vegan wet dog food, specially conceived for dogs affected by pancreatitis or in need of low-fat dog food. Such dogs will have their symptoms improve drastically within a few weeks. 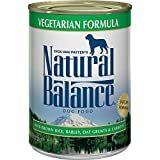 Overall a vegan wet dog food that offers a wonderful value for money with a good ratio of proteins, carbohydrates, vegetables, and micronutrients. It’s also cost-effective so worth being trialed over a few weeks! Make sure your dog treat pouch is full of these delicious vegan dog treats — they are free of gluten, soy, corn, fillers, wheat, and animal products! 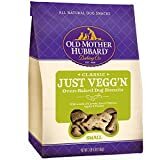 Plus, those yummy plant-based dog treats are of good help for your dog’s periodontal health, so go ahead with a bulk order and stash them up, ha! A friend of mine has two dogs, both on a vegan diet. She has been using V-Dog Vegan treats for a while now and she confirmed that after long researches, they are the most nutritious Vegan treats for dogs out there. The bag doesn’t reseal so make sure you store them in a dog food container. Also, each bone is of quite big so try to break them into smaller pieces so they last longer. It depends whether you want to use these vegan treats as dental sticks in the evening, or dog training treats. Whether you are a dog breeder or a dog owner, we feed our dogs their regular meals as well as delicious dog treats. These are not the healthiest but they do are vegan dog treats, and unfortunately, there aren’t many available out there. Their low price makes them a go-to choice for plant-based treats that are free of artificial preservatives. The list of ingredients is neither good nor bad and this is due to the vegan diet being very restrictive. For example, the first ingredient is whole wheat flour, which is one of the cheapest ingredients available to manufacturers. Cane molasses are the fourth ingredient in the list and we only recommend them sporadically — they are refined sugarcane or sugar beets! Dogs can be healthy on a well-balanced, nutritionally complete vegan diet, as long as all necessary nutrient requirements are met. These can be met through plant-based sources as well as mineral sources. The right balance of different plant-based sources of protein, such as beans, corn, soy, and whole grains, can still provide the needed essential amino acids. If you are not sure where to start, here are some good sources of protein in case you want your dog to go vegan. Quinoa is an ancient pseudo grain loved by the Incas and since very recently, we’ve adopted it in our diets. It was about time for our pets to get introduced to these marvelously nutritive seeds. Quinoa has a high protein content unlike other grains — around 16 grams per 100 grams! If you are not familiar with proteins, they are broken down into 20 amino acids and this is how we judge the quality of a protein profile. Like with eggs and most meats, Quinoa holds the nine essential amino acids your body has to receive from foods; and they are present in adequate proportions. Allowing your quinoa seeds to germinate and sprout is a way to boost its nutritional value. Sprouting is a process where micronutrients get broken down which increases their bioavailability to your body. Delicious and healthful, sprouted quinoa can be used to complement your dog’s meals, and yours too! You can store this homemade sprouted quinoa in your fridge for five days. Whether it is in the form of tofu, soy sauce or soy milk, it is no doubt that soy is a favorite vegan food for most, because of the wide culinary use. One cup of soybeans contains roughly 68 grams of protein. For dogs, it can also be a great source of protein if you want them to go on a vegan diet. Pet owners who want their dogs to avoid eggs and meat while still maintain the proper amount of protein may want to check out soy products. However, as a forewarning, do not trust all of the soy foods you see in the market. Indeed, some of these soy products are not authentic and only enhances the bulkiness of the “vegan” dog food — they act as fillers. It is still up to you to read the labels for the percentage of protein in the soy product that you have. A cup of oats roughly has 26 grams per cup (only 6 grams for oatmeal). It is yet another great vegan dog food to consider that can be eaten by your pet safely. The protein that oats provide is around 17 to 37 percent, which makes them quite similar to soy products in terms of protein content. Other than protein, oats can also lower your dog’s cholesterol levels due to the soluble fiber and it also contains various micronutrients such as B vitamins, zinc, and iron. Oats have a great amino acid profile, a bit like quinoa. Rice has a total of 4.3 grams of protein per cup. Eating rice is an excellent way for your dogs to go vegan and have energy all day due to the protein content. In Asian countries, rice is a staple food in big meals of the day such as in lunch and dinner – making their dog’s food roughly of the same content. Rice takes on the position of what Westerners would have a steak, pasta or mashed potato for. Because rice is also one of the most common dog food ingredients, it is no surprise that rice can be commercialized in a bad way so dogs are not really getting authentic nutrition from the dog food they receive each meal. Make sure the rice is fresh and authentic – it is best to prepare real rice at home rather than use food mixes. You should also avoid overfeeding, as too many calories from rice can cause obesity for dogs. Some dogs are allergic and intolerant to grains; if it’s your dog’s case, you may have to switch to a grain-free dog diet. Both wheat and corn are moderately high in protein content, at 15 percent and 7 percent respectively, but their amino acid profile is below average. If you don’t have access to rice or wheat, you can go for corn instead but you will lose in nutritiousness. The only problem is that some dogs can be allergic to them. As with rice, moderation is needed due to extremely high levels of carbohydrates, generally very much refined which makes them even less attractive in terms of nutrition. Great post! I no longer feed my dog processed food (kibble). I feed it home-cooked meals following the recipe: Chicken breast, brown rice, a few veggies and a dab of coconut oil and olive oil. Yes, I believe meat is very essential for dogs due to their natural physiology. However, I also feed my dog natural superfood such as Spirulina. It provides so much nutrients and is naturally grown. Having good nutrition can improve your well-being, your mood, and even your happening. However, creating a diet that provides you with best nutriment can be hard, particularly in this modern world encircled by clarified treats and fast food.Be alert of what chemicals are in your food. That is in general why it’s best to limb to natural nutrient like natural produce and fresh proteins and organic grain options. You should keep off these like you would anything else hazardous because they can slow down your metabolic rate and hurt your diet. You should take part in a contest for one of the best vegan dog blogs on the web. I will recommend this site!